I was heading to Makapuu via the scenic coastline route pass Hanauma Bay and this car in front, er the line of cars in front, because of the lead car, driver and passengers probably so preoccupied sight seeing that they failed to notice that they holding up everybody behind. Didn't look like a tourist rental car even. More probably a resident giving mainland friends a guided tour. Well after a while it gets a bit annoying. I mean hey how about pulling over and letting the convoy behind through. Idiot. I usually have a huge tolerance for slow moving traffic as well as waiting in a slow moving line at a checkout counter. I figure you live longer that way. When I reached Sandy Beach I decided to pull over to the side of the road and spot the leader of the pack a lap lead before I continued on my own way. The air was clear and I could see Molokai island (middle right of pic above). 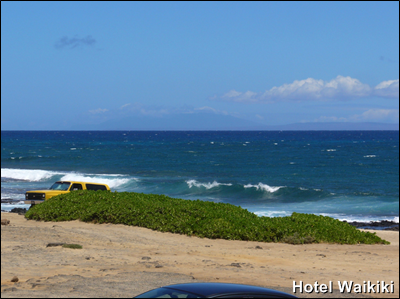 If you squint real hard, to the left of Molokai, in the middle of the pic, you'll be able to make out the outline of southern California or is it Maui. The US Postal Service is making the news again. If you haven't heard there'll be a 120,000 worker layoff. Well, after losing $9 billion so far this year. In addition to being in the red to the tune of something like $8 billion last year, the sentimental value of postal workers have long worn off and if they go the way of the Pony Express so be it. I suppose it wouldn't be the same situation if the economy was up and the rest of the nation was doing well financially. But that's not the reality. If the USPS had the gumption to keep up with the times they could have cornered the deliveries for the Internet marketplace. Virtually everybody orders items from the Internet, but the postal workers were too against having to lug middle-size or hand truck large-size packages instead of the less heavy letters to the mailboxes. Why would they when they get paid the same for what would amounts to less work. Well, now we don't need them. As a cost cutting measure, no more Saturday delivery is in the works. It's also been rumored that mail will be delivered Mon-Wed-Fri instead of the usual 5 days a week schedule. Last week I paypal-ed $20 to Honolulu Weekly, a weekly alternative newspaper. 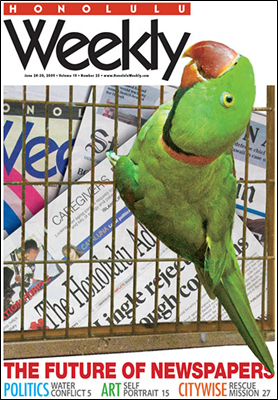 Honolulu Weekly was about to go belly up and they put out a plea to the public for contributions to keep them in operation. I haven't read an edition for a few years now. The Free paper gets dropped off at random newstands around town. 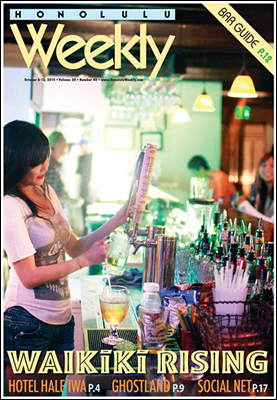 When Honolulu Weekly first got started Honolulu was a 2 major newspaper town, now there's only one major daily. However, Honolulu Weekly doesn't seem to want to keep up with the times either. The eclectic articles that they primarily focus on are not eclectic anymore based on standards of stories that you can get daily doses of on the Internet and are available to read on many personal blogs for that matter. Ever seen the type of topics we post, in muse, in rant, or in rave, on personal blogs get printed in the Honolulu Star-Advertiser or the monthly Honolulu Magazine. Now, meeting a weekly deadline on a consistent basis year after year is not an easy thing to do, and it does demand a genuine passion to hang in there. As a business, there's not much money in it either for the publisher or the motley crew staff. My thoughts are that if Honolulu Weekly does not shift their advertising from print to their webpage, currently their sole revenue generating base because of the weekly's free subscription, Honolulu Weekly will end up obsolete for the same reason that most newspaper went under. These types of "free" things are on the way out. Even now Civil Beat seems to be testing the waters to start charging for viewing their content. Though Star/Ad now is offering a digital fee half of their original wanted charge. Only trick is you gotta prepay for 1 year. I'll just stick with KITV4 for now. Their stories seem to be the same as what Sta/Ad publishes. Nate- by "free things," you must mean the complimentary paper versions. Heck, paper versions are on the way out altogether at least as far as revenue generators for the publishers whom are left standing after the dust settles. Albeit, the evolutionary dust has already settled, the dummies. Think of all the staff people they've been laying off in recent years, yet the reality still flies over their heads. The Star-Advertiser, their original digital subscription rate was $50/per year play on 5-O, I suppose, they thought that was suppose to be funny, but it seems the joke is on them instead. If Civil Beat wants to charge the public for the privilege of reading their postings, ? ?, boy is that's a smart move or what? ?